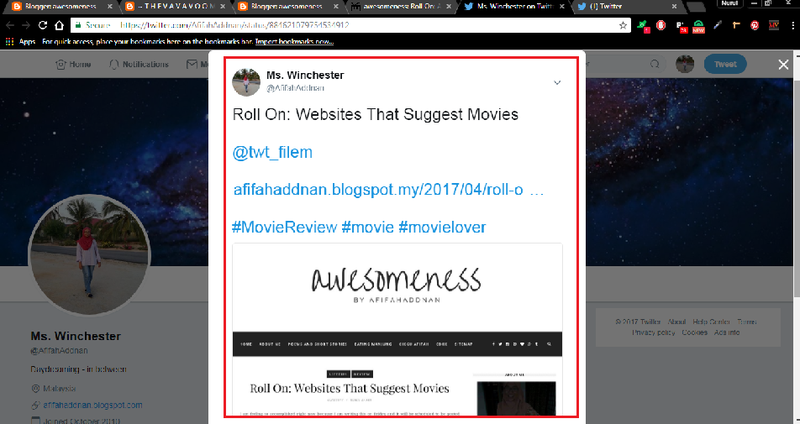 Roll On: A Retweet Kind of Contest by @afifahaddnan ENDED! My TWO cheapskate prizes are - that means two winners okay - chosen randomly. 1. Become my featured blogger (like this gal HERE) which means you will be on my slider thingy for a week. 2. I'll make a short video like that one in my About Me (sidebar) and you gonna be featured on my sidebar for a week. - Roll On: Why Malaysian Get Fake Medicine and What To Do? 2. You need to have a Twitter account for that lah kann. 3. 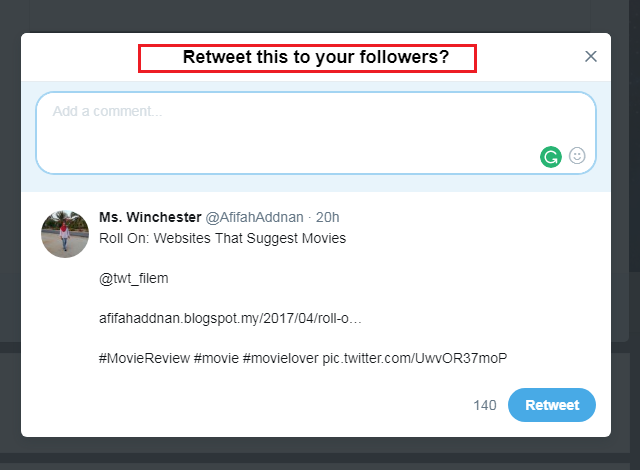 Comment your tweet link and your Twitter username. The most obvious thing is that I will follow you afterwards (stalking much). This segment will end next week - 18th July 2017 @ 9 PM. Apart from the traffic, I was also thinking to get myself more blogger/twitter friends. The idea of Malaysia own Blogger/Twitter supportive hashtags is also quite tempting. 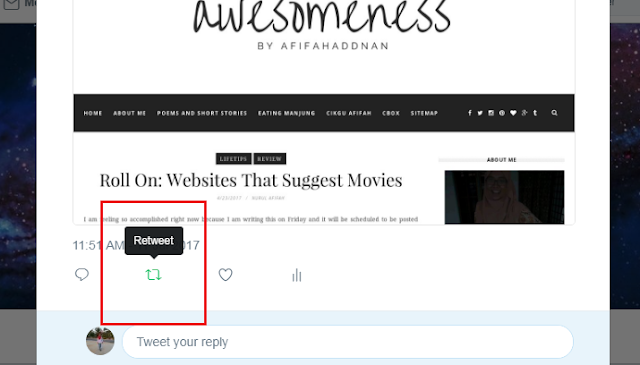 Just click one of the titles and you will be directed to the tweet Like this. If you use laptop or PC , this will come out instead. 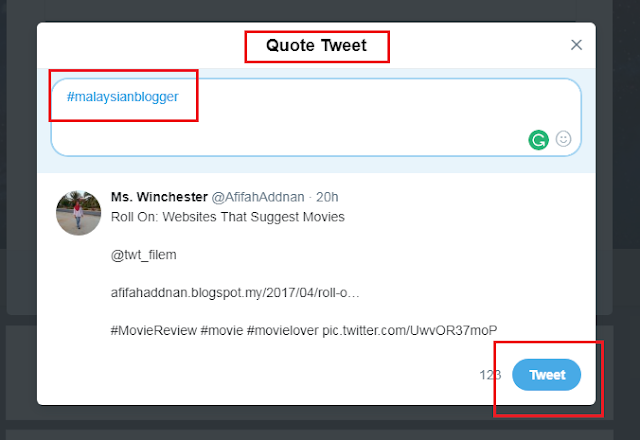 Type in #malaysianblogger. You wil see it changes to Quote. Tweet it! hahaha baca tadi mcm complicated.. bila tgok cara nak ikut rules tue senang ja pla..
Am I lame because I don't own a twitter account? 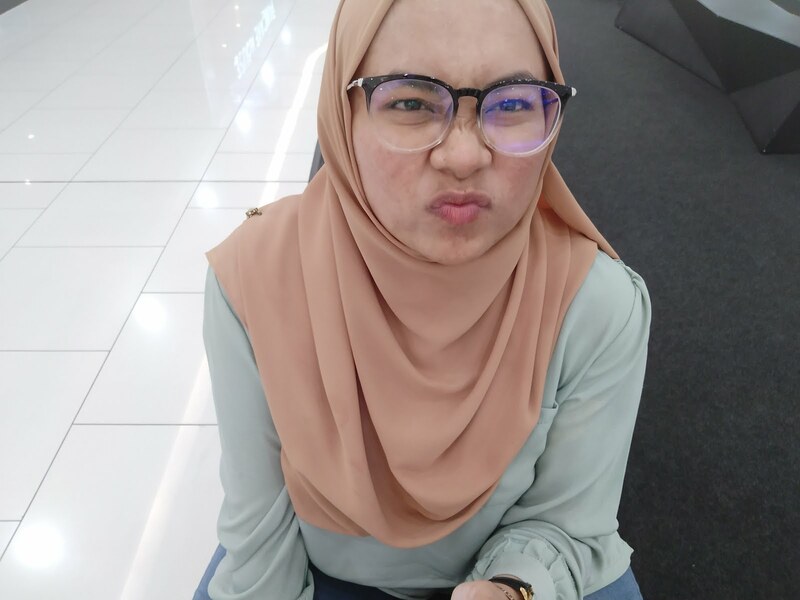 I am so tempted to you are (though it is nonsense) but i'm a nais human being so I'm gonna say "you are cool just the way you are"
yes, nasib baik sempat join lagi, hahah.